Indie Retro News: Battle Princess Madelyn - Ghouls ‘n Ghosts inspired spectacular, December 6th for Switch, XB1, PS4 & PC! Battle Princess Madelyn - Ghouls ‘n Ghosts inspired spectacular, December 6th for Switch, XB1, PS4 & PC! In 1988 Capcom released one of the finest Arcade games ever to grace the gaming scene, and that game was the incredible Ghouls 'n Ghosts which appeared on lots of different systems. It is a game that if you haven't played it, you are seriously missing out! So as an inspiration to GNG, the developer Casual bit Games has announced that the gorgeous upcoming game of Battle Princess Madelyn is not only coming December 6th for PS4, Xbox One, PC and Nintendo Switch, but there's a new trailer to view as well! Battle Princess Madelyn is a game that follows the journey of a young knight in training, Madelyn, and her ghostly pet dog, Fritzy. They set out on a journey to save her kingdom and her family from the clutches of an evil wizard. 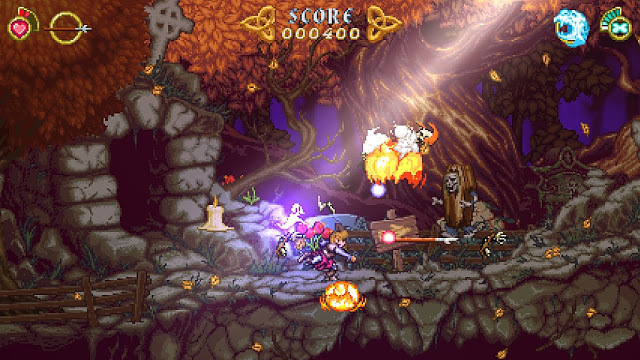 In terms of the game itself , it is very much inspired by the classics such as Ghouls N' Ghosts and even Wonder Boy 3, and will feature a number of themed areas such as graveyards, swamps, castles and even lush green countrysides, set with beautiful pixel art, great retro gameplay, a fantastic movie quality soundtrack, and plenty of monster killing arcade action!